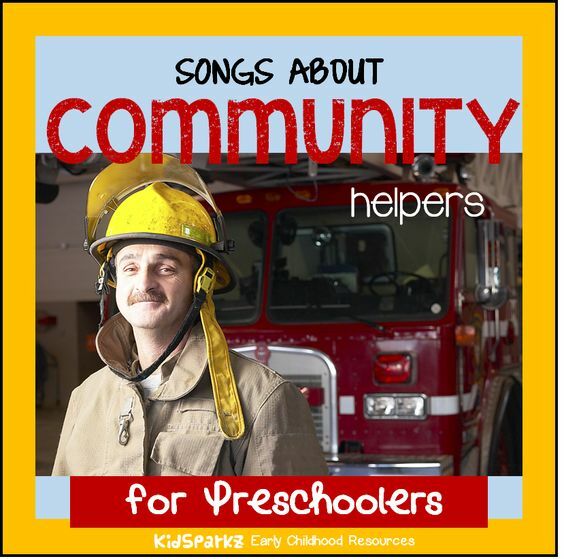 Here is a collection of songs and rhymes for a Community Helper theme, for preschool, pre-k and kindergarten lesson plans and curriculum. Help's on the way, help's on the way. We can dress real fast. And all the firefighters put out the fire. Four police officers watching over me. Two police officers - how fast they can run! One police officer saw smoke faraway. And the firefighters came right away! What is my job? What is my job? Can you guess? Can you guess? I help people get well. Other verses: I can fix the water pipes.I deliver letters. I make tasty meals for you. I keep your pets healthy. I can teach you new things. I can help if you get lost. Through rain or snow or sleet or hail. Well, s/he'll be sure to put it out. First the farmer sows his/her seeds. Then s/he stands and takes his/her ease. And turns around to view his/her lands. Pat a cake, pat a cake, Pizza Man. And don't forget 5 pepperonis, please!! If you sneeze, use a tissue please! I wish that I could skate and have some fun. I'm sure that I'd be number one! I wish that I could ski and have some fun. I wish that I could play hockey and have some fun.